It is said that politics is the art of the possible. We need good leadership that will enable Americans to reach broadly acceptable solutions to problems. 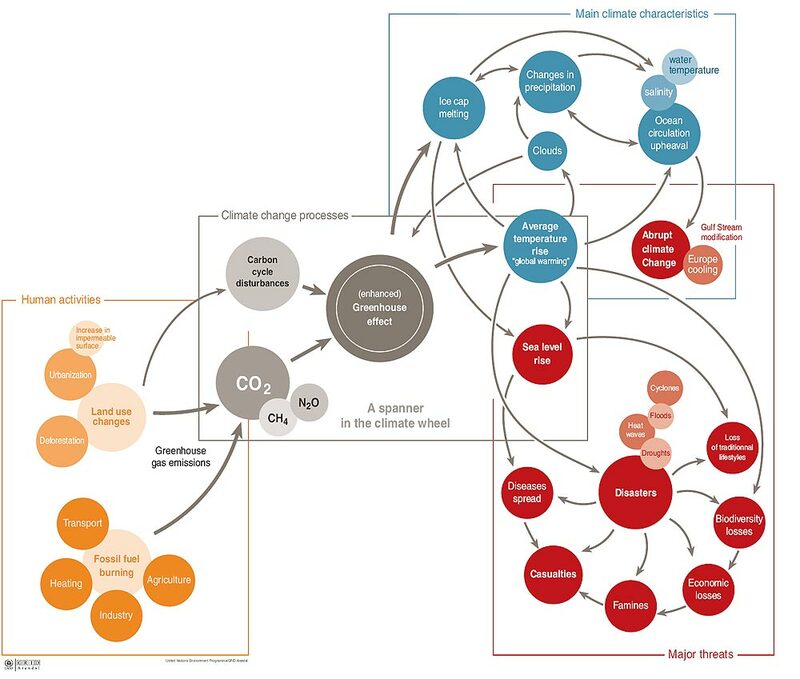 What follows is an analysis of climate change, that will affect the future economic growth and future generations. In the American Museum of Natural History, New York there is a climate change exhibit. 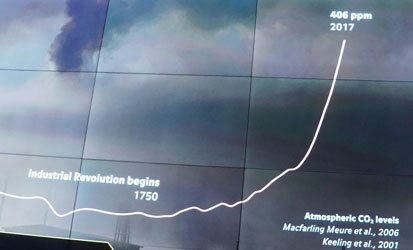 It graphs the increasing concentration of atmospheric carbon dioxide since the beginning of the industrial revolution. This graph indicates that atmospheric CO2 concentrations grew (280 parts per million in 1750) to 406 ppm in 2017. 1 What does this mean for future economic growth? The following analysis says we better do something, we hope swiftly, because the science of climate change details the consequences if we don’t. 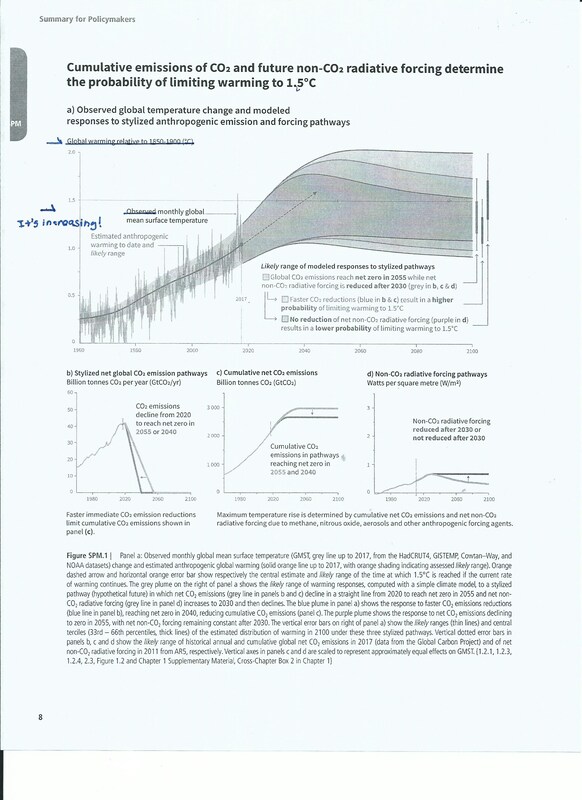 The following is somewhat quantitative because it involves the measurement and prediction of present and future CO2 concentrations and temperatures. It is somewhat like stock market analysis, because it involves a crucial increasing variable (temperature or maybe earnings) and then the contingencies and complications along the way. where: ∆W is the amount of external work done, such as raising a weight. ∆Q is the amount of heat energy added (the production of heat involves the combustion of fossil fuels). Fossil fuel technologies, comprising 79.6 % of the world’s energy production. 3 They produce CO2 concentrations that greatly exceed the earth’s absorption capacity. The direction of this analysis is clear; the climate will become warmer. But the detailed effects of increased concentrations of CO2 on the earth’s temperature is a question that lies at the heart of climate science. · 350 more million people will be exposed to severe drought. · 31-69 million people living on the coasts worldwide will be exposed to flooding from sea level rise. · Economic growth decreasing by 0.5% in developed countries, we estimate this from the below. The consequences of this slight amount of average global warming are biblical. · Major cities in the equatorial band of the planet will become unlivable (causing also massive migrations). · 40 more million people will suffer from severe drought. · Phase out coal power. · Rapidly expand access to renewable energy. · Agree and implement an international treaty that facilitates the transition to a low-carbon economy. · Scale up financing for climate-resistant health systems. Why is the country so polarized, making solutions to climate change presently impossible? The 3/21/19 PBS Newshour visited Louisiana with the University of California Berkeley sociologist, Arle Hoschschild, whose book (2016) we reviewed in, “The Limitations of Very Limited Government.” The “Red State Paradox” notes that the poorest rural states receive more money from the federal government in aid than they pay in taxes. Why do they hate government so much? Look at the visible benefits of jobs in the extractive industries and the common costs of pollution. Add to this a set of cultural values that causes voters, in this case, to strongly disdain, “the establishment,” who historically were the well-to-do planters – but who during the Reconstruction were not above playing on social divisions - in order to preserve their property interests. They are now the petrochemical companies that emit wide-spread pollution that the people she interviewed have to live with. There are Trump supporters in whom these sort of viewpoints are strongly ingrained, and to whom he appeals. However, there are also others who can recognize practical policies that will improve their lives; but it will also be very important not to disappoint them. We think these are the people who the Democrats should appeal to with practical programs that give hope, that can help them and the whole country. The radical left of the party may propose ideological programs; but these ideas are not politically feasible with the country so divided. This is the observed average monthly world temperature from 1960-2017. Climate change is not a “hoax”. It will require concerted, systematic actions to remedy. · What lies ahead for rural America is county consolidation and more school mergers. · In areas with a strong rural manufacturing base, housing can be scarce. But developers do not like to build in those areas due to the small scale. A federal plan would encourage such housing. · Rural hubs will survive with investment. Partner with regional development efforts. A 3/29/19 NYT article describes the present inability of Western democracies to act for the common good. “Across Western democracies, politics are increasingly defined by opposition – opposition to the status quo, to the establishment and to one’s partisan rivals. People have always organized more easily around what they’re against than what they’re for, but this is different. (The author notes that Brexit has been animated by opposition to the European Union, rather than any clear alternative to membership in it.) Politics have grown viscerally tribal and voters instinctively destructive. American politics has traditionally been described as an orderly process: “interest articulation” by groups and then “interest aggregation” by political parties. The latter is necessary in order for voters to choose among coherent programs. The rise of social media and the ability of anyone to run for office have weakened the influence of parties. We live in a civilization where we believe in continued progress; material, certainly, and maybe even moral. However, a historian will disagree, noting that civilizations rise and fall. A question that has nagged us for many years is, what brought an end to the bronze age world of the Iliad and the Odyssey? The broader question is what also happened to Egypt’s Old Kingdom (that built the pyramids) and the Hittite Empire in modern-day Turkey (that built Troy)? In “Climate and the Late Bronze Collapse: New Evidence from the Southern Levant,” Langutt, Finkelstein, and Litt (2013) studied carbon-dated pollen grains in cores taken from the Sea of Galilee, borne by winds from the north. They affix the dates of the droughts that ended these three civilizations between 1300 BCE and 1100 BCE. People have been moving to find a better life throughout history. This is now especially true in Honduras, where people are being forced to move north by a combination of political reasons and famine. On 4/2/19 the PBS Newshour aired a segment, “Drying fields, dying livelihoods push Honduran farmers north.” They interviewed a farmer in the western Honduran province of Lempira who noted that 10 years ago, he could harvest 4,000 pounds of corn from his land. Now he is lucky to get 500. He lost 90% of his crop due to drought and has no money for an irrigation system. He says, “We’ll have to get out of here, to find a place where we can get a better life.” According to the UN, there has been a surge of migration from the rural areas of Honduras where farmers lost an estimated 82% of their corn and bean crop last year. Climate change is already affecting Central America, and this is just the beginning. The U.S. can’t just react to the consequences of climate change and other events. It has to deal with the carbon dioxide concentrations and help people adapt to the new world that will be upon us, sooner rather than later. According to Thomas Pickering, former U.S. ambassador to the U.N., the world is becoming increasingly “disheveled,” with the attractiveness of authoritarian alternatives growing that aren’t good for anyone except a few. The allies are now trying to sustain stability without the U.S. present. In “Manias, Panics and Crashes,” the economist Charles Kindleberger (1978-2011 eds.) essentially wrote that complex systems require a stabilizer. The U.S. will have to go through an increasing period of trust rebuilding to regain that role. In a 4/9/19 NYT article, “The Problem With Putting a Price on the End of the World,” David Leonhardt writes. “Economists and other policy experts have long focused on (the) idea of carbon pricing…the underlying concept is simple. When a product becomes more expensive, people use less of it. Carbon pricing is an elegant mechanism by which market economics can work on behalf of the climate rather than against it. But if the idea’s straightforwardness is its great economic advantage, it has also proved to be its political flaw. Energy, for utilities and transportation, is a major cost of living. And across the industrialized world, the middle class and the poor have been struggling with slow income growth. For those who are still skeptical about global warming, it would be at least prudent to take out a solid insurance policy – given the above evidence. “Frosty Gilliam, an independent oilman in the Permian, greeted me at the reception desk of his office, on a sparse stretch of business highway in Odessa, Tex., and beckoned me into a conference room decorated in what he described as a ‘Tuscan feel,”…The atmosphere in the office was convivial, and I hesitated to raise a question that would poison it but after half an hour I asked how he thought about climate change. (These are the “C” words.) For 14 seconds, Gilliam stared at me across the table, the hint of a smirk on his mouth. (But the reporter notes) “Seeing the whole problem…as a result of an economic arrangement rather than an unsparing fate or a flaw in human character, is exceedingly grim but also kind of optimistic. One system can dominate for a while, then another can sneak up and take its place. Mr. Gilliam is being “provisional” or maybe "smart"; but government is not like that. The role of government is to encourage change in the right direction, and markets will follow. We will discuss the implication of all this for investment policy in our 5/19 posting.